If you're obsessed with relaxed dressing when it comes to your personal style, you'll love this totaly chic pairing of a grey coat and Imoni Leather Tassel Gloves from Neiman Marcus. Choose a pair of dark green rain boots to make the ensemble more current. 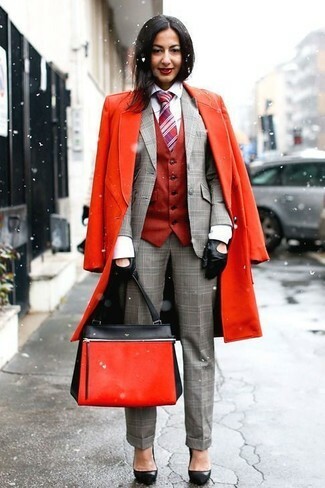 We all outfit for comfort when it comes to dressing up, and this combination of a red coat and Imoni Leather Tassel Gloves from Neiman Marcus is a practical example of that. And if you want to instantly up the style ante of your look with one piece, add black leather pumps to the equation. 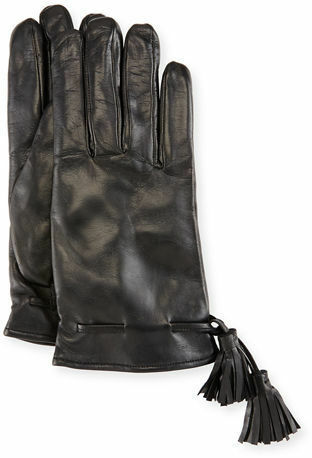 Go for a dark green coat and Imoni black leather gloves, if you want to dress for comfort without looking like a slob. You could perhaps get a little creative when it comes to footwear and lift up your look with black suede over the knee boots. Wear a brown leopard coat with Imoni Leather Tassel Gloves from Neiman Marcus if you're on the hunt for an outfit idea for when you want to look casually cool. Up the cool of your ensemble by wearing black suede ankle boots. If you're all about relaxed dressing when it comes to your personal style, you'll love this incredibly chic pairing of a camel coat and Imoni Leather Tassel Gloves. You could perhaps get a little creative in the shoe department and elevate your look with black cutout leather ankle boots. Make an olive puffer jacket and Imoni black leather gloves your outfit choice for a casual-cool vibe. Grab a pair of grey athletic shoes for a more relaxed vibe. If you want to look cool and remain cosy, consider teaming a black cropped sweater with Imoni Leather Tassel Gloves from Neiman Marcus. Bump up the cool of your ensemble by completing it with black suede pumps. If you're a fan of relaxed dressing when it comes to your personal style, you'll love this cute combination of a red turtleneck and black leather gloves. Let's make a bit more effort now and opt for a pair of black leather tassel loafers. 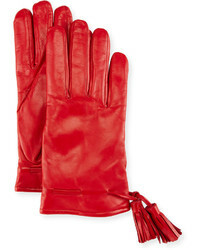 If you're all about relaxed dressing when it comes to fashion, you'll love this seriously stylish combination of a red coat and Imoni Leather Tassel Gloves. Kick up the cool of your look by wearing black leather pumps.